Enhance your studies with FlashTutor from PreLicense.com. Our FlashTutor product delivers interactive flashcards to help students practice for the insurance license exam with key concepts and identify areas of weakness. Flashcards are a proven review tool for successful retention and recall of key concepts. 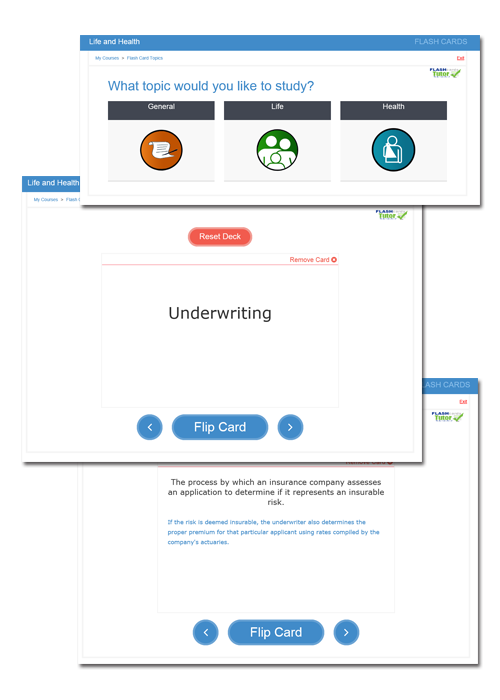 PreLicense.com elevates the traditional flashcard model to an intuitive, mobile-friendly tool with an added dimension of interactive instruction and explanation that no other flashcard product offers. This insurance license exam prep tool is also mobile-friendly for on-the-go study. PreLicense.com is here to help you study the extra mile for your insurance license exam. Choose General Principles or a specific line of insurance authority to practice. Study hundreds of key terms selected from insurance state licensing exam outlines. Flip cards for complete, concise definitions. Test your retention. Remove the ones you know and repeat the ones you don't. Clarify the most complex terms with expanded explanations and make connections between insurance topics and key terms for a more complete understanding.